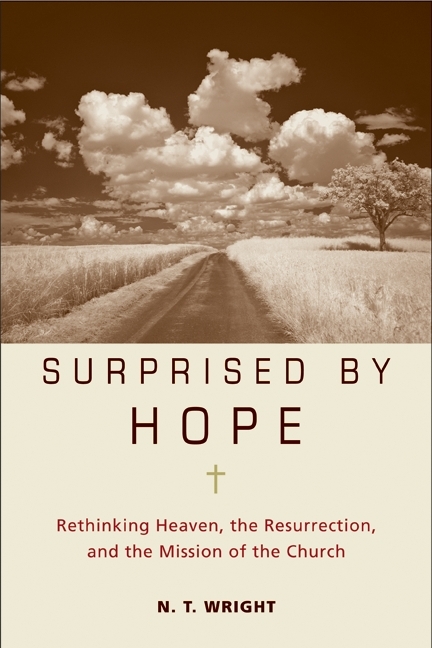 Subtitled “Rethinking Heaven, the Resurrection, and the Mission of the Church,” this book by N.T. Wright, noted Bible scholar and Bishop of Durham, does just what it says on the cover, although in some cases I imagine the book’s readers would not so much be “rethinking” these ideas but thinking them through for the first time. It certainly felt that way for me. My attitude toward heaven has always been that I believe in it and that I hope that I’ll end up there. I’ve thought about how Jesus’s resurrection might be part of getting me there, but I’ve not thought much about “the resurrection of the dead” mentioned in the Bible and in the Nicene Creed that many of us say each week in church. “God’ll sort it all out” has been my motto. N.T. Wright says that many of us have adopted notions about heaven that we’ve picked up from the culture, starting all the way back with Plato in the days of the early church. In this book, he attempts to take readers back to the what the Biblical writers might have meant when they talk about resurrection, heaven, and the kingdom of God. He explains that resurrection was, for them, something that happened to the body and not merely a spiritual state. The resurrection is not going to heaven when we die but is a physical return to bodily form. Heaven is the paradise where those who die wait for the resurrection. As for the possibility that some won’t go to heaven or be resurrected, Wright does believe in a final judgment and some form of condemnation, but he treats his ideas about it like a thought experiment and less like clear teachings from scripture. In fact, several times in the book, he reminds readers that he’s merely putting up a signpost that points into a mist. I found Wright’s arguments to be interesting and often persuasive, but not always convincing. I could sometimes think of scriptural passages that seemed to contradict what he was saying, and sometimes I thought he was working too hard to explain something that we simply don’t have the language to explain or the minds to fully understand. In the end, I still have the “God’ll sort it all out” attitude. Biblical passages about the future and about heaven read to me like poetry meant to ignite the imagination and stir up hope with us, not something that we can apply a systematic understanding to. Wright could be correct about how it works. It just doesn’t matter so much to me. For Wright, however, belief in a bodily resurrection is crucial because it informs our attitudes about life on this earth, today. If we’re destined to leave here forever, what does it matter if the whole place goes to pot before we’re gone? And if life on earth is a blink of an eye compared to life in heaven, shouldn’t the church only worry about saving souls so they’ll go to heaven? What does it matter if they have clean water or enough to eat if their souls are saved? Wright believes that life on earth does matter, that Christians are called to get a head start on building God’s kingdom on earth, that we are meant to take care of the planet and the people in it, and that this work will, in some way, become part of God’s final renewing of the world where we will live eternally. I agree with Wright that our life on earth does matter, and I love his vision of helping build God’s kingdom now, but I’m not convinced that a belief in a bodily resurrection is necessary for Christians to care about these things. Still, one of the things I love about N.T. Wright, even when he frustrates me, is that he does balance a desire for theological truth with a desire to do good in the world. I’ve read many theologians who seem only to care about the hereafter, and I’ve read others who don’t seem to give two figs about whether the church is teaching people about God as long as it’s doing good. Wright cares about both, and the last couple of chapters in this book—when he describes how the church could work for God’s kingdom now by eliminating third world death, speaking truth to power, supporting libraries, writing symphonies, and more—are truly stirring. I read this book with my church’s book group, and it led to some lively discussions. Opinions about the book were all over the map, with some finding Wright arrogant and others finding him hard to follow. Everyone seemed to agree that the book is provocative, and several found parts of it to be inspirational. My own opinion skewed more positive than the rest of the group, but I think that’s because I’m comfortable with and tend to like Wright’s systematic approach, even though I recognize that this kind of thinking can only get you so far. I’m not sure how accessible this book would be to non-Christians. Wright’s emphasis is on clearing up misconceptions within the church, and so the book will probably appeal mostly to those who’ve been exposed to—or even share—these misconceptions. This entry was posted in Nonfiction, Religion. Bookmark the permalink. This is the first time I’m reading a review of a Christian literature. I enjoyed your thoughts and the argument it generated. Faith, by its abstractness, throws religion into a state of personal encounters. Yes, our thoughts on any matters of faith are going to be influenced by our personal experiences and backgrounds. That’s one of the reasons I love discussing books like this with others at my church. We all bring something different to it. I actually picked up this book a few weeks ago, maybe even when this review was first posted. I picked it up because I recognized the author’s name and had been wanting to read something by him. However, after skimming through it a bit, I concluded that it wasn’t quite what I was looking to read right now. I read Marcus Borg earlier this year and really liked him, so I’m trying to read other authors with ‘provocative’ Christian thinking, like Rob Bell, NT Wright – oh, I should also read Donald Miller too. If you like Borg, I definitely recommend the book he co-wrote with NT Wright, The Meaning of Jesus. They disagree about an awful lot, and it was interesting to get both sides and to see such serious disagreement handled in a civil way. I don’t think I’ve actually read anything beyond a few articles by Bell or Miller, but they’ve both been on my radar for a while.